But what do those mobile moments look like, and how can companies capitalize on them to optimize customer engagement and drive increased brand loyalty? To break down the important steps in this process, we created the infographic at right, which you can access fully here, to demonstrate some of the everyday mobile moments that companies can capitalize on to drive action from their customers. 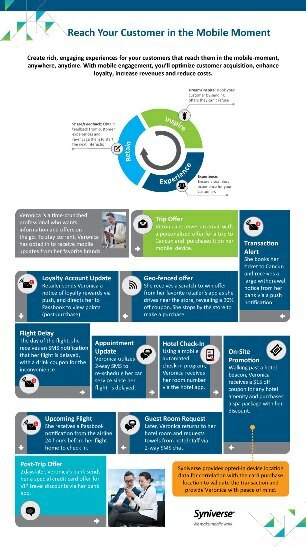 The graphic imagines a day in the life of a connected customer we’re calling Veronica. She’s a time-crunched professional who wants information and offers on the go. To stay relevant, Veronica has opted in to receive mobile updates from her favorite brands. During the day, Veronica receives a variety of different communications on her mobile device and utilizes her phone to take any number of actions based on those communications using various mobile channels. I invite you to click on and download a copy of this infographic and, if you’re looking for more resources to help you optimize engagement with your mobile-first customers, check out our new Mobile Engagement Expertise Web page. Here you’ll find videos and our latest guide, “Transform the Customer Experience with Mobile,” which introduces Syniverse’s Mobile Engagement Maturity Model and shares examples of how companies can use the model to advance their mobile engagement strategy. And I would love to know any thoughts you have on our new infographic or our other Mobile Engagement expert resources. Please leave a comment.